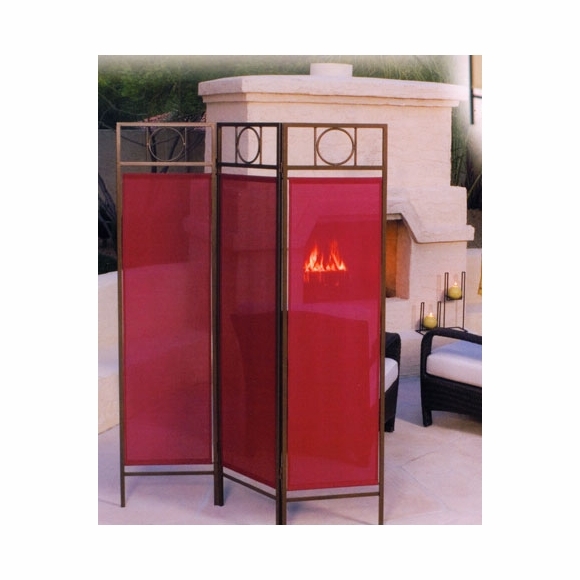 Outdoor Privacy Screen: weatherproof screen provides privacy for patio, deck, balcony, pool, garden, yard, porch. Or use as an indoor room divider. Powder-coated steel frame comes in three colors: bronze, black, or white. Marine-grade panel fabric comes in eight colors: sand, burgundy, blue, green, yellow, terra cotta, ebony, and sage. Only colors shown in selection box are currently available for shipment. Shown in main image above: bronze frame with terra cotta panel. Shown in small images (from left to right): bronze frame with sand panel, white frame with blue panel, black frame with green panel. Dimensions: 55"W x 72"H; weighs 20 pounds. Polyester encapsulated acrylic fabric imported from China. 3-year mfg. warranty. Assembles in about 20 minutes. Special order. Please note that some of the manufacturer's packaging is currently mismarked. For instance, sand panel may arrive to you marked beige. The manufacturer only produces a sand. However sand and beige are so interchangeable that a labeling error was made. This may apply to other colors, too.